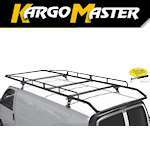 The Aluminator Truck Racks - this baby is built to last and take any weather Mother Nature can muster. You’ll see her coming from blocks away. We recommend some sunglasses; your future looks bright.